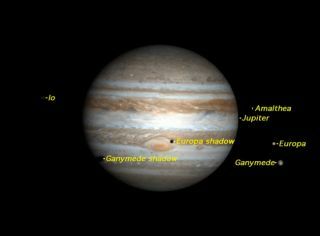 On Nov. 6/7, 2010, the shadows of Europa and Ganymede will cross Jupiter's face simultaneously, while the Red Spot gets a black eye. This view shows Jupiter as it will appear on Nov. 7, 2010 at 1:15 a.m. Pacific Daylight Time from California. This weekend, a remarkable seriesof events will takeplace on Jupiter: The planet's four big moons will cast shadows on thegasgiant planet that can be seen from Earth using a small telescope. The four bright moonsof Jupiter are known as the Galilean moons after theirdiscoverer GalileoGalilei. As they revolve around Jupiter, they sometimes pass across theface ofthe planet as seen from Earth, as well as behind the planet and in itsshadow. All of these events can be observedwith a smalltelescope. You just need to know where ? and when ? to look. First, a word of caution: Theovernight between Saturdayand Sunday is when we switch back from daylight saving time to standardtime,so be careful you get the correct time for your location. Because the complete sequence ofevents is only observablefrom the U.S. West Coast, we will use Pacific Time here to discuss thebestviewing times. Observers further east will miss the later events, andshouldadd the appropriate number of hours to the times depending on theirlocationand time zone. The show begins at 8:53 p.m. PDT(11:53 p.m. EDT) on Saturday(Nov. 6), when Jupiter?s largest moon Ganymede begins to cross theplanet'sface. Because Ganymede has a relativelydark surface, it appearsbright against the limb of Jupiter ? but quickly appears to change to adarkgray against the bright central parts of Jupiter's disk. This can beseen withtelescopes that have as small as a 5-inch aperture. At 9:47 p.m. PDT, a second moon ?Europa ? followsGanymede across Jupiter's face. Because Europa?s surface is icy, itreflects a much morelight than Ganymede, and closely matches Jupiter's cloud belts behindit. As aresult, it vanishes in all but the largest telescopes, perfectlycamouflaged. At 10:24 p.m. PDT, yet another moon ? the volcanic Io ?begins to disappear behind the opposite side ofJupiter. At 11:52 p.m. PDT, Europa's shadowstarts to take a notchout of the western limb of Jupiter. This can be seen with telescopesthat have assmall as a 3-inch aperture. Two minutes later, Ganymede moves off thedisk ofJupiter and is once again a bright spot in the sky. By now, Jupiter'sGreat Red Spot has begun to rotate into view, right behindthe shadow ofEuropa. The Great Red Spot now has a black eye. Thiscomputer-generatedimage shows a simulation ofhow Jupiter will appear in telescopes at 12:15 a.m. PDT on Sunday, Nov.7. Note that this uses a generic imagefor the planet?s cloudsurface ? currently, the cloud belt in which the Great Red Spot rideshas fadedto match the neighboring bright zones. Io has emerged from behindJupiteritself, but is still eclipsed by Jupiter?s mighty shadow and henceinvisible. At 12:31 a.m. PDT, Europa leaves the disk of Jupiter. At 1:12 a.m. PDT, a second shadow, that of Europa, puts thebiteon the west limb of Jupiter. We now have two shadows creeping acrossthe faceof Jupiter, while the moons casting them are off to the right, awonderfullythree-dimensional effect. At 1:41 a.m. PDT, Io emerges from Jupiter's shadow, endingitseclipse. At 2:00 a.m. PDT, Daylight saving time officially comes toanend, and you should move your clock back to 1 a.m.
Now, at 1:34 a.m., Pacific Standard Time, Europa?s shadowmoves off Jupiter's disk. Finally, at 3:08 a.m. PST, Ganymede?s shadowalsomoves off the disk. You may be puzzled by the fact thatGanymede leads Europaacross Jupiter?s disk, but Europa?s shadow precedes Ganymede?s all thewayacross. That?s because Europa orbits muchcloser to Jupiter thanGanymede, so that the angular distance between Ganymede and its shadowis muchgreater than the angular distance between Europa and its shadow. This article was provided toSPACE.com by StarryNight Education, theleader in space science curriculum solutions.